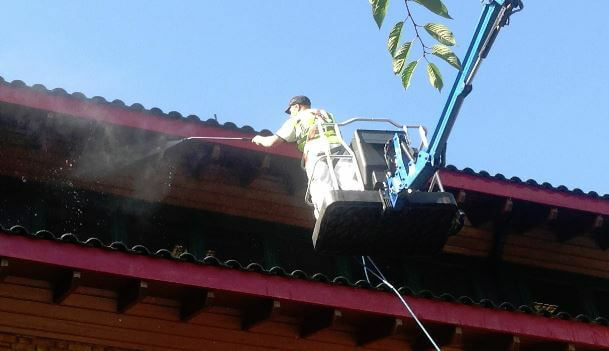 MC Property Maintenance specialises in the painting, decorating and maintenance of buildings in Surrey – we have a full range of services and a great deal of experience. We are one of the South East’s leading property maintenance companies. Whether you have a residential or commercial property that needs maintenance, you can call us on 01243 530076 for advice, assistance and a quote. We carry out work for a huge range of clients across Surrey – completing maintenance on buildings everywhere from Guildford and Woking to Reigate and beyond. We have a reputation for completing thorough and careful work for businesses and private properties. You can call on us for with painting and decorating as well as repairs and gutter cleaning. We specialise in high access work, carrying out roof survey, light installations, general maintenance and more. We have our own fleet of cherry pickers so we can access buildings of all heights and sizes. MC Property Maintenance has the expertise and experience to take projects from start to finish, including planning, organising and managing complicated operations. Our team is made up of skilled tradesmen who are fully qualified and comply with health and safety requirements. We work with many Surrey-based businesses of all sizes – companies count on us for all forms of building maintenance. We pride ourselves on very high standards of work and excellent value for money. For commercial and industrial properties we have completed everything from roof surveys on warehouses to a fresh coat of paint for a storefront. We also provide services for private properties. You can rely on us for all kinds of home maintenance ranging from painting and decorating to high access cleaning. Don’t hesitate to get in contact today if you need help at home. If your property in Surrey requires any maintenance work, our team is always on hand to provide assistance. Call us today on 01243 530076 and speak to a friendly member of staff. Alternatively you can send us a message – we can offer any additional information you need or provide you with a quote.